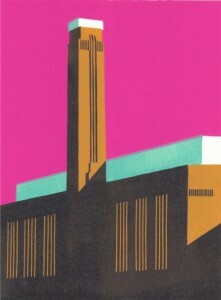 Paul Catherall is a London-based printmaker and illustrator. He has become renowned for his clean, sharp linocuts of architectural landmarks, exhibiting at numerous solo and group shows, as well as his figurative illustrations for high-profile clients. Drawing influence from classic mid-20th century poster designers, such as Tom Eckersley and Edward Wadsworth, and inspired by the semi-abstract landscapes of Cezanne, Catherall combines an expert eye for composition and colour with consummate draughtmanship to create striking and iconic images. The subjects of his prints include controversial London buildings (Elephant and Castle Shopping Centre, The National Theatre) and celebrated landmarks (such as Battersea Power Station, Tate Modern and New York’s Flatiron). Paul’s clients include Transport for London, London Elects, British Airways, Bloomsbury, Harper Collins and he Southbank Centre.